Description: A special "shock fence" installed beneath the leading edge of the left wing is visible in this underside aerial view of NASA's F-16XL #2 research aircraft. The small structure assisted researchers in NASA's Supersonic Laminar Flow Control (SLFC) program in controlling the shock wave coming off the F-16XL's engine air inlet when the craft flew at speeds above Mach 1, or the speed of sound. The two-seat F-16XL, one of two "XLs" flown by NASA's Drdyen Flight Research Center, Edwards, California, flew 45 missions comprising over 90 flight hours during the SLFC project, much of it at supersonic speeds up to Mach 2 and altitudes up to 55,000 feet. 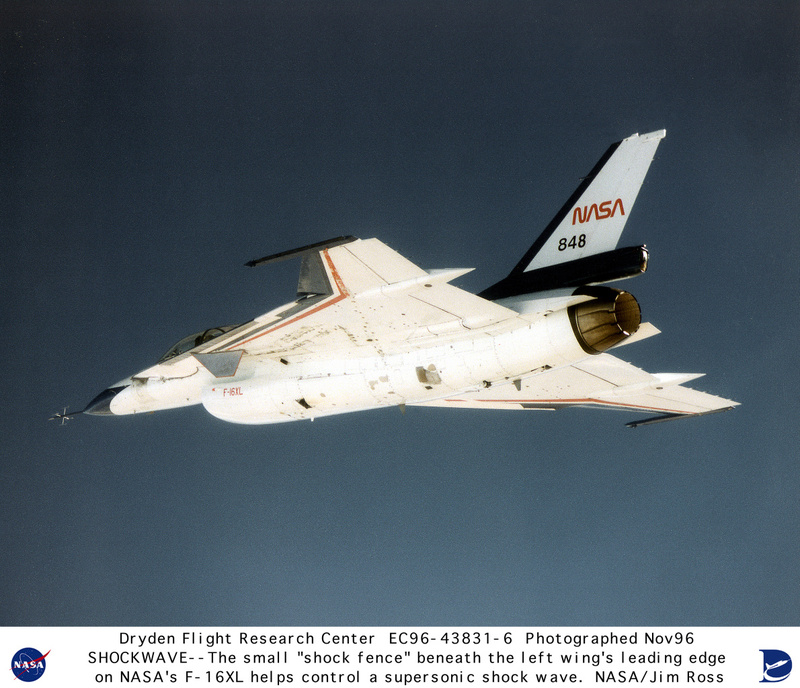 The project demonstrated that laminar -- or smooth -- airflow could be achieved over a major portion of a wing at supersonic speeds by use of a suction system.